Come on folks: now is the time to show Steve some support. Let’s make it massive. SODEM is a highly visible, peaceful protest outside the Houses of Parliament. The main site is Old Palace Yard but we also congregate along the Pavement next to College Green (where the media circus is) and outside the entrance to The Houses of Parliament. Nearest tube is Westminster. The purpose of the protest is to remind Parliamentarians and the world’s media that we haven’t gone away. We are there to hold politicians to account and to prevent the voice of Remain from being ignored. Established on 5/9/2017 Steve Bray is there everyday the Politicians are sitting. Initially this was from 11-6 but as the date gets closer the hours get longer and we now have evening and occasional overnight Vigils too. The protest area is safe and well policed. 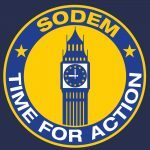 Follow us on Facebook SodemLondon, Twitter @snb19692 and Instagram SodemAction. Everyone who has an interest in Remaining in EU is welcome to join us at SODEM. In fact we say #WeAreSodem. Please bring flags and homemade placards if you can. Regional flags on long flag poles are particularly important to show we are a national movement. But most importantly bring yourself. Come for 10 minutes or 10 hours. Do whatever you can but do something. It’s not a street stall and we are not here to debate but protest. The protest is peaceful and good humoured. While there’s nothing more cathartic than shouting at the seat of power we are never offensive or foul mouthed. We also don’t intimidate or harass anyone. The protest is now so high profile that we have formulated a few guidelines to help avoid any bad publicity. Our success has meant that we are now occasionally accompanied by Leave Means Leave and UKIP ‘activists’ as well as Yellow Vest / DFLA / EDL members. You will also find a lot of press attention is focussed on SODEM. This can be quite difficult and we recommend active ignoring. Turn your back, engage a fellow remain protestor in conversation, go and get a cup of tea. Please don’t rise to anyone shoving a phone in your face, don’t even smile or blow a kiss. We aren’t there for them, we are there to protest to the Parliamentarians. If press want to do interviews check who they work for. Get a card. Don’t just do random interviews for anyone. There are loos at Westminster tube (but you’ll need 50p) or The Royal Court’s in Westminster Square are good (you can’t go in in overtly protest gear) and have a cafe and electricity. There’s also Central Hall nearby. Finally, please only bring what you can carry. Don’t expect someone else to stand guard over your possessions. We’ve had an issue with Yellow Vests thinking the George V statue holds a significance to our protest and trying to force us from it, when we we actually just looking after overnight bags!